There's always room for your frozen favourites inside this 15 cu. ft. capacity chest freezer. Spills are a snap to wipe up with smooth, rounded Easy Clean Corners and you can keep food safe and sound with the secure key lock. Plus, two large storage baskets inside the freezer give you more options to organize your frozen favourites. The RCA 3.5 cu. ft. Chest Freezer features a space-saving upright design that fits almost anywhere, whether at home or in the office. A defrost drain offers a passage for water to drain and makes it simple to clean, while the adjustable thermostat lets the compact freezer maintain a consistent temperature and lets you set different temperatures to store a variety of food types. The convenient upright design makes it easy to find your stored foods once it's time to thaw them out and cook. This spacious freezer also includes a shelf for organization, making it easy to stay prepared for holidays, parties or unexpected guests. 14.8 Cu. Ft. 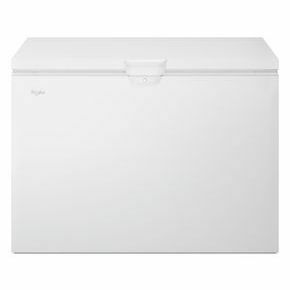 Chest Freezer with Large Storage Baskets in White There's always room for your frozen favourites inside this 15 cu. ft. capacity chest freezer. Spills are a snap to wipe up with smooth, rounded Easy Clean Corners and you can keep food safe and sound with the secure key lock. Plus, two large storage baskets inside the freezer give you more options to organize your frozen favourites. 14.8 Cu. Ft. Chest Freezer with Large Storage Baskets in White is rated 4.7 out of 5 by 730.